When I first started experimenting with vegetarianism and later veganism, one of the most difficult parts was figuring out how to get enough protein in my diet, and more importantly, how to get protein from a broad and healthy range of sources. Trust me, if it was healthy to survive on peanut butter alone, I totally would. Protein seems to be a murky topic. People either think we’re either not getting enough and “MORE PROTEIN” becomes their gospel, or they think we should all calm down and eat less protein lest we turn into body-building savages. According to most experts, we should aim to get 10% – 35% of our calories from protein. For women, that’s around 46 grams a day, and for men, 56 grams a day. To be honest, I fall short of that most days, but I’m working on it! I’m aiming to fill up on nutrient-rich sources instead of just chips + guac (so guilty). This post is a round up of my 15 favorite vegan protein sources. No matter what kind of diet you follow – vegan or not – this post is meant to educate and inspire! You don’t have to be vegan to enjoy animal-free protein sources. Lastly, it’s not all about the protein – we need to keep our vitamins and minerals in check, too. So be sure to educate yourself and consult a professional before making any drastic changes to your diet! Now, onto my favorite breakfast these days! I have been loving my Best Damn Breakfast Potatoes, a green smoothie, and some sprouted toast with hummus, hemp seeds and sunflower seeds! Wow, that just made me sound like the biggest hippie. I don’t care – it’s so tasty and filling! Now for the protein math. Not bad! What’s your go-to breakfast these days? I’d love to know. Cheers, friends! 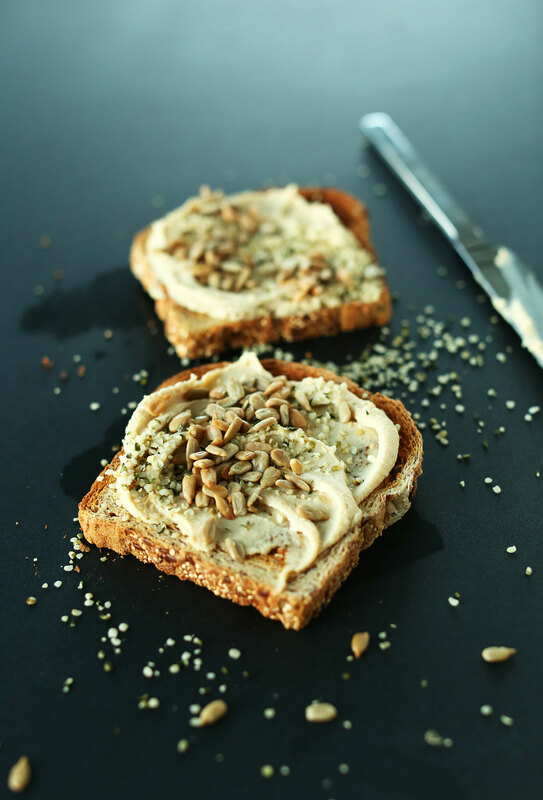 Simple sprouted toast with hummus, sunflower seeds and hemp seeds. The perfect healthy breakfast or snack. Toast your bread. Then top with hummus, hemp seeds, and sunflower seeds! Devour immediately. wow seedy hummus toast just SOUNDS delicious, I cannot wait to try it!!! Thanks for this awesome recipe, I actually really didnt know seeds had protein in them! Are you sure about the Oats? Is it 13 per half a cup of raw or cooked Oats? I am confused as every bag of Oats I’ve seen says only 7 grams of protein per half a cup of oats…? I’d like to say thank you so much for consistently providing such reliable, clear and tasty recipes and nutritional guides such as this. It is hugely appreciated, especially as I am new to veganism, and this is my first port of call for tasty new ingredients! Thank you for all your hard work. Dana, thank you so so much for this. I am raising a 1 year old and it’s getting a bit tricky to ensure she is getting adequate protein/other solids now that she cant just survive on breastmilk! It has also made me realize how inadequate my own protein intake is since becoming vegetarian 11 months ago. This is gold & I’m printing it to hang in the kitchen. My only question is, are the amounts youve listed for the oats, quinoa and lentils referring to cooked or uncooked? Thanks for serving the plant based community with your master mind recipes. Blessings to you! Thanks for the list!!! Most items are already part of my daily diet so I guess I’m all good ;) Should try to use tempeh more maybe! Hello! I love your website and am debating whether to purchase your 31 month of meals. I’m currently on Weight Watchers and finding out that I was getting way too many carbs and not enough complete protein as a vegan. How much complete protein do your dinner meals contain? I recently learned about hemp seeds as being complete protein, but the fat content is what I will have to watch out for. I also bought some hemp oil to make into salad dressing and thought perhaps that might be a good way to bring my complete protein levels up. If you dinner meals contain ample protein, it may make it easier for me to plan to my breakfast/lunch meals depending on the dinner meal profiles. So, are your dinner meals contain “complete” proteins? I can’t wait to try the hummus on toast. That is a sure winner! Hmm, I’d say it is a mix between carbs, veggies and protein. However, you could always vary the recipes a little bit to accommodate your needs. The good thing is, you can always return it if as we have a money back guarantee if it’s not what you want. Quick question: Are the figures for cooked or uncooked (when applicable :) )? Thank you for putting this together; I’ve already referred to it several times! Can I ask you what you use on sandwiches to substitute cheese? I just use hummus, avocado and sauces to create that flavorful, creamy effect. This is fantastic! I’m not vegan, but my husband is vegetarian and I am most days. I’ve been scouring the internet looking for high protein, vegetarian breakfast ideas that aren’t egg based. This will definitely make it into the rotation! Lovely! Glad we could help, Kallie! I decided to eat for nutrition and started last November, so I’ve been searching pinterest for vegetarian recipes and keep coming back to your blog! I have now signed up so I can go directly to your website. Thank you for making it easier to transition from bad habits to good! My morning smoothie consists of cinnamon, ginger, chia seeds, flax seeds, kale, blueberry Kifer, coconut almond milk, and banana. I also throw in some blueberries or pineapple too. I’m hoping that gives me what I need to start the day! Since I’ve been eating only nutritious food my skin is clearer ( I had a ruddy completion) and my arthritis pain is less. Your recipes are such a big help. I am stuck on beet Reubens for lunch. A recipe I found on pinterest. I roasted my own for the first time and it is totally yummy! Thanks again for the help. I’m not vegan, but I’m definitely passing this along to my sister and my niece and I may try it too…it looks so good! Thank you for sharing this! I’ve been looking for a list like this since I started crossfit and noticed that I feel much better with a bit higher of a protein intake. Of course! Thanks for sharing, Hannah! YUM! I have a question. For that hummus, do you use roasted salted tahini or the raw one like from Artisana? Both flavors are very different and will make a big difference in the final hummus. Just wanted to know before I shell out >$10 for the jar at my co-op lol! Thanks in advance, Dana! I believe mine is roasted, unsalted! Thanks for the catch! I believe I was estimating based on cooked oatmeal for some reason, which was misleading. So I’ve updated for the dry oat amount. Thanks, Heather! I got my information from a couple of trusted sources, and back checked them online with nutrition calculators. Of course, it’s likely never 100% accurate, so double check me when in doubt! I definitely need to amp up my protein, but I don’t exactly love meat. Thanks for the tips-I didn’t know my hemp had that much protein in just 1 tsp-wow! honey bear FOR DA WIN. High fives! Love your protein list, the “where do you get your protein” gets a little redundant for us vegans. Most of your list are staples in our house. 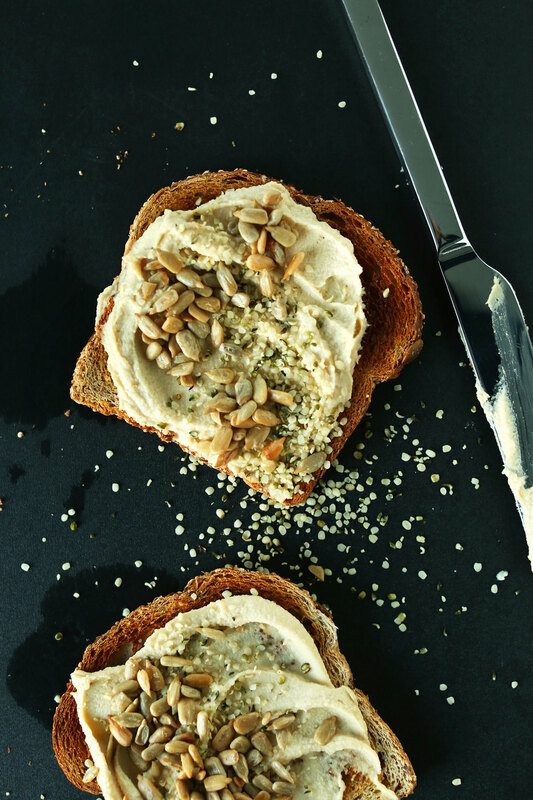 Love the hummus toast with hemp and sunflower seeds too, yum! Holy mother of protein in sunflower seeds. Never woulda thunk! Loved this post! It’s also important to note that not all of the 19 grams of protein will be absorbed. Depending on the bioavailability of the specific protein sources your body absorbs about 10 grams of protein per hour according to multiple studies. Smart tip! Thanks for sharing! So what can an allergic to pulses do?? ?… This is my misery… I can’t eat lentils, nor chickpeas nor beans, but I can eat peanuts galore… I’m not vegetarian but I try to increase my meatless days to more than three so I’m out of solutions, when my meals have less protein I get hungry very quickly…though I could eat quinoa guacamole every single day, I’d like a little bit of variety…. hmm, that’s tricky. Wish I could be more help! Perhaps a nutritionist could help you find a good balance? Go the plant based foods! 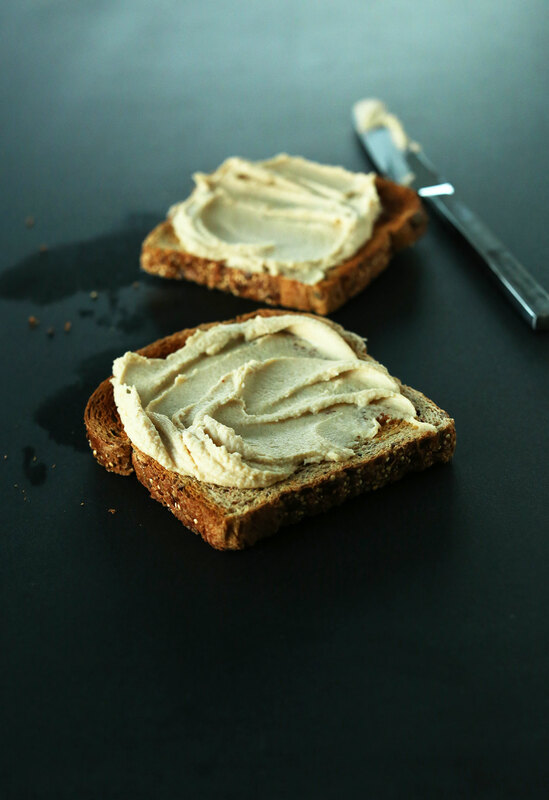 Your hummus on toast looks divine! Totally been monitoring my protein since I took up running over a year ago. This stuff is gold. Thanks, Dana! I’ve been vegan since 1/1. A whopping 20 days. For me protein is very important because I’m breastfeeding. While I love the challenge of a completely plant based diet it does take effort to maintain a healthy balance. My go to breakfast is a version of thd Oh She Glows 5-minute Power Oatmeal. Soaked almonds, chia and almond butter drizzle take my bowl of yummy oats to 15g, I pair it with a hemp protien coconut milk, 12 g there. In all almost 30 g for breakfast! My 12 week maternity leave ended on 1/5 making quick and easy really important. Hummus toast is what’s up! I’ll have to check out your archives for your favorite Hummus recipe! ! Great info! Thanks for sharing, Andria! Good luck on your journey! Never thought of hummus on toast with seeds! I’ll have to try it with the buffalo hummus I just made! Hi there- thanks for the list. I too love peanut butter and your peanut butter mouse is a favourite of my family. However, I was concerned to see nutritional yeast on your list. I can understand its use for the B vitamins lacking in a vegan diet, but it’s status as a neurotoxin would prevent me from using it. hmm, never heard that. I just love its cheesy flavor, vitamins and only use it on occasion. I think it’s OK in moderation. This is an AMAZING post! I am a huge fan of using lentils and different nut butters to incorporate some protein into my diet. 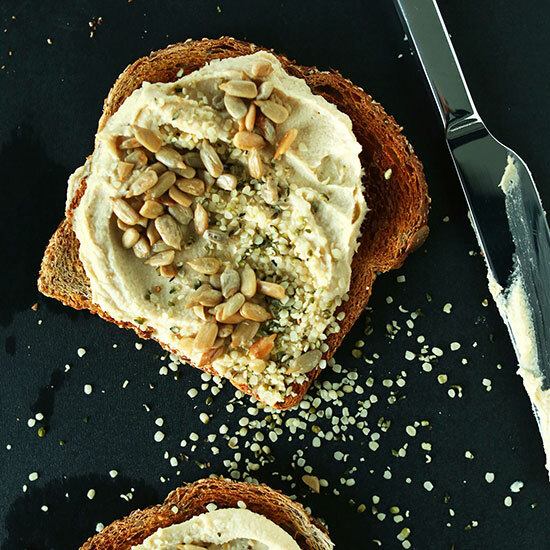 Lentils are so versatile, and nut butters…they’re my weakness. Thanks for this info!! great information – thanks. i had know idea that sunflower seeds had that much protein! you wouldn’t happen to have this information as a simple list that could be easily saved for future reference do you? I do a terrible job in terms of getting enough protein and really need to be more mindful of my intake. You wouldn’t perhaps consider doing something similar for protein would you? I don’t! But you could easily do a screen grab and tuck it away on your computer somewhere for reference. That’s what I do with similar resources! Looks great. I calculated the nutrition for your toast and came up with different numbers. Your protein is too high for those calories – without the bread, according to your hummus recipe, the calories are already at 250ish and 9.2g protein. I have no idea where to get bread that’s 30 cal and 5g protein per slice. Can you tell me which bread you used to calculate this? Trader Joe’s sprouted bread! It’s amazing! Sounds yummy. It’s 90 calories per 5g though, I think your recipe would be 430 and 19g protein in this case. Thanks again – I’m making this with Rye bread tonight. Nice! I’ve tried tempeh only a couple times and struggle getting into to it as consistent protein source in my diet. However, I’ve just added it to this list because I realized I left it out and had originally planned to share. Updated! This is a great post for plant based lovers who are struggling to get their protein! Big smoothies or bowls of oatmeal with lots of toppings do it for me! My go to breakfast is always oatmeal with peanut butter and a banana. That has a pretty good amount of protein, too! I would also live on peanut butter alone if I could. Your protein infographic is PERFECTION! So is your food :) My little vegan family is loving your food and enjoying new things each week as we plan our meals. Thank you! So kind! thanks Nicole! Hope this is helpful! Love this – I’m a hummus addict so I know I’ll love this! Thank you so much for these! I’ve been vegan for a couple of years now and just recently started logging my diet more closely so I can monitor my protein intake. To my surprise, I do better on most days than I thought I would! But this list was a great reminder – I find it’s easy to get into such a routine of eating the same few protein sources with every meal. And the hummus toast looks delicious! Thank you so much for the 15 recipe detox guide! The photography is stunning. Each photo is detailed to perfection making each recipe look delicious. And they are! I’ve made the detox smoothie, granola bars and black bean burger. Thanks!! Hope you love it, Susan! It’s actually more like 8-10% unless you’re an athlete. Have you read The China Study? It’s a really great look at nutrition, with some really astonishing fact and figures! Thanks Kiki! I haven’t but it’s certainly on my list! Love all the gorgeous photos of nutrient-dense plant protein! Just a quick question for clarification- did you mean to put 9.5g protein per 1/4 cup sunflower seeds? There’s typically about 7g per 1/4 cup which would be 28 grams/cup. And for buckwheat, would that be buckwheat flour? There’s usually about 4g per 1/4 cup = 16g per cup of flour but for cooked buckwheat groats there is in fact 5.6 grams, the picture just looks like flour. I hope that doesn’t come off a being picky or anything- just wanted to clarify in case anyone else was a bit confused! Thanks for clarifying! Yes, I was referring to 1 cup cooked buckwheat – flour was all I had for an image :D And for sunflower seeds, you were right! I miscalculated there. I knew it was bound to happen. Fixed! Thank you! Love this post! I’ve been vegetarian for years, and I have yet to try hemp seeds. I need to get on that! I am trying to lose belly fat by following a plant-based diet and each morning, I drink a smoothie using the new Vega One formula – which has 20 grams of protein and 6 servings of greens!! I usually add about a 1/2 cup of mixed berries and 1/2 an orange with it – I also “chew” my smoothie to get some of the fiber benefits so it doesn’t turn into straight sugar when I drink it. Nice! That sounds like one seriously legit breakfast. Thanks for sharing! Nice! Thanks for sharing, Valentina! I think my Avo Toast just flew right out the window…. THIS. LOOKS. AMAZING! =) Pinned! I drink A LOT of plant fusion protein powder. My brain thinks it’s a milkshake… It’s delicious with frozen banana chunks, frozen dark cherries and some PB2. Yum! Nice! I tried Vega this year but that’s it. I need to try more! I’ve been really liking the “Raw Protein” protein powder (from Garden of Life) – organic, raw vegan, GF, and it has 17 g protein per serving! I have it every day with my smoothie. Dana I just want to say thank you for all of the wonderful recipes! I browse around minimalist baker all the time and reference your recipes, and make amazing food. Keep it up! Yes! Plant Fusion is amazing! I have found that I can throw in half a banana, a large handful of spinach, almond milk and ice with the Chocolate Flavor and I feel guilty every time I drink it thinking it tastes way too good to be good for me! I tend to be in the camp of not worrying much about protein, thinking that eating a fairly balanced diet ensures that I get enough but I’ve been wanting to do the math over the course of a couple of days to see if that’s really true. I do eat a lot of oats, especially for breakfast so it’s good to see that on your list. Yes! Oats are great in that regard. Hope this was helpful to you, Chris! While not vegan, or even vegetarian, I strive to eat a mostly plant-based diet. Thanks for sharing this information–I should try to eat a bit more protein! I was surprised by how much protein quinoa has! Lovely! thanks for sharing. I think it’s always good to know what you’re getting from the foods you eat. And yes, quinoa is a super star!